Wu Shu Kwan Chinese Boxing can be safely and enjoyably practised by men and women, young and old. The unique Chinese Boxing movements and exercises will fight the unwanted flab and at the same time develop and trim up your whole body quickly. Your body weight will soon be normalised. Many trainees lost an awful lot of stubborn fat without even trying when other drastic dieting or severe measures had failed. The desired weight loss is brought about by improved body metabolism and circulation, thus burning off your unwanted fat without your realising it. Chinese Boxing makes it easy for anyone who wants to keep trim and fighting fit. It helps women to develop poise as they learn to defend themselves effectively. Personal confidence comes naturally and easily to those who train. A highly organised and systematic martial art such as Wu Shu Kwan Chinese Boxing offers one of the most efficient and painless ways of instilling discipline in those who need it – particularly the younger ones. These tenets will help and guide you to become a much better person – physically, mentally and spiritually. Through fulfilling your own personal ambition, you will eventually be a valuable asset to the society. These are not empty words; in Wu Shu Kwan, we practise what we preach. Many mental and physical conditions, such as anxiety, irritation, apathy, high blood pressure and stomach ulcers, may be blamed on stress. It is of paramount importance to be able to come to terms with stress. Wu Shu Kwan Chinese Boxing training can have a beneficial therapeutic effect on people by getting them away from their worries and the pressures of work caused by stressful modern living. The British Medical Association urges people to take more exercise to improve their health, and emphasises that “people who exercise regularly feel healthy and are less likely to become depressed”. You owe it to yourself to improve your wellbeing by participating in a very enjoyable, beneficial and exciting activity. Please refer to section on How to Enrol for complete details about joining us. It is very easy to make friends when you train with Wu Shu Kwan, because we are a big family consisting of like-minded, helpful and caring people, who are practising an effective martial art in the pursuance of total fitness and ultimate self-defence. 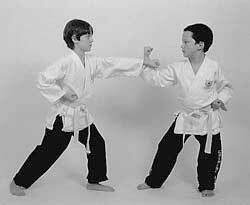 Many members have formed deep and lasting friendship after meeting up in Wu Shu Kwan. 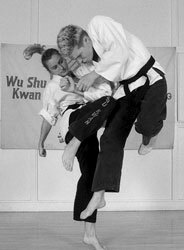 Knee techniques as taught in Wu Shu Kwan can be used to their best advantage by women to defend themselves. Youngsters enjoy Wu Shu Kwan training. They become stronger, happier and much more disciplined, and as a result they are full of confidence. A youthful Grand Master C. K. Chang (8th Degree Black Belt) kicking an apple off someone’s head. This technique requires extreme agility and accuracy. 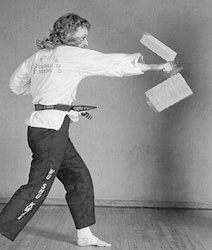 Trish Chang (7th Degree Black Belt), a Senior Master Instructress and a Guinness World Recorder holder, punching a building block suspended in the air. 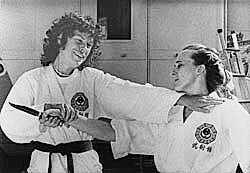 Kate Hoey, a Member of Parliament and the former Sports Minister, practising a self-defence technique with Trish Chang. The MP is a very keen sports person. 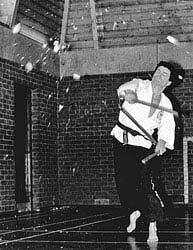 Andy Hucklesby (7th Degree Black Belt), a Senior Master, pulverizing an apple with a three-section staff. 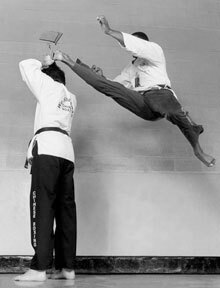 Peter Lewis (6th Degree Black Belt), a Senior Master, breaking roofing tiles placed on someone’s head with an outward-curve kick, which requires extreme accuracy, power and agility. 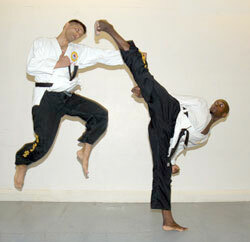 Paul Ingleton (5th Degree Black Belt) (right), a Senior Master and a Guinness World Recorder holder, can use his finely honed kick to hunt for any part of his opponent's target including the head. 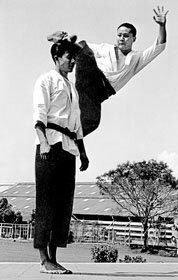 He is seen here practising with Jeff Joseph (5th Degree Black Belt), also a Senior Master. 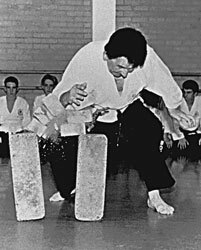 Des Radcliffe (3rd Degree Black Belt), a Senior Master, chopping three bricks in front of the class to show his students how to unleash Wu Shu Kwan's phenomenal power. He is one of the toughest martial artists in the world. Three of the most senior instructors (with an astonishing total of 19 Degrees of Black Belt between them) showing the kind of flexibility achieved through systematic Wu Shu Kwan training: (from left to right) Andy Hucklesby, Celia Sisman and Trish Chang. 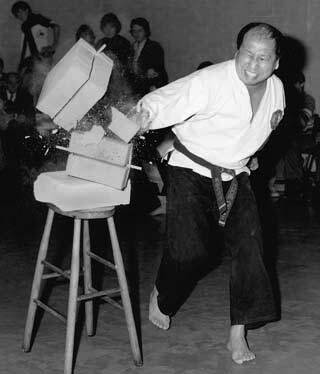 Eddie Cheah (8th Degree Black Belt), a Senior Master, is a man of formidable explosive power. He can be seen here smashing his way through building blocks with a reverse knifehand, a technique rarely used because it demands an extreme level of power and toughness. A class training in progress in Paddington, London. 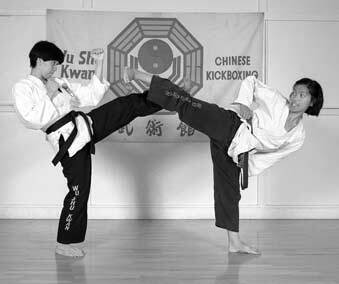 Evelyn Ingleton (5th Degree Black Belt) (left), a Senior Master Instructress, using an effective leg technique to block a side kick from her sister Vanessa Hirani. 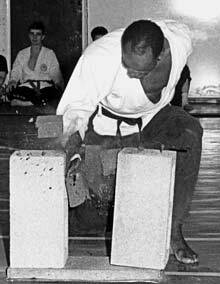 Adison Bridet (5th Degree Black Belt), a Senior Master, chopping two bricks with his bare hand. Kenneth Lee (marked ↑), aged 89, is the oldest active Wu Shu Kwan member. 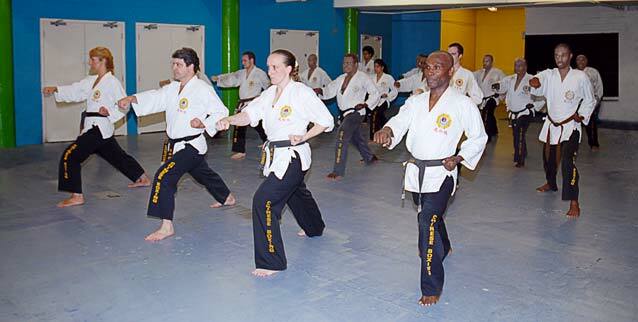 He holds a Maroon Belt and is pictured here with the instructors and Black Belt holders in a beautiful tropical park in Port of Spain, Trinidad's capital. Men and women, young and old will benefit from Wu Shu Kwan's unique training system.